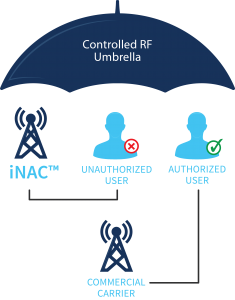 The Intelligent Network Access Controller (iNAC™) is a managed access solution that forms a radio frequency umbrella around a precisely defined target area and, through a main cell tower, attracts cellular devices within the outlined range. The Cellular Interdiction Solution (CIS) provides the system operator with the capability to selectively permit or deny communications from these cellular devices based on a rich policy engine, including identifying which wireless devices are approved in addition to allowing 911 calls from even unauthorized devices. The challenge posed by controlling communications is the delicate balance between managing coverage throughout the target area without impacting the commercial networks that exists on the other side of the border, in many cases just feet away. Balancing the overwhelming build out of commercial network capacity with a controlled communications environment is a complex challenge. Tecore’s ability to leverage the same technology as the commercial wireless networks to create a credible countermeasure across the spectrum of wireless technologies deployed provides a comprehensive and cost-effective solution to preventing unauthorized communications. The concept of Managed Access is actually quite simple. Wireless devices leverage protocols and technologies to exchange information with their commercial networks. Most devices today support a combination of technologies across 2G, 3G and 4G LTE. As a cell phone moves from one area to the next, the device selects the best technology and channel for communication. Information is then exchanged between the device and network to provide service to the user. Once a network accepts a device, the device is allowed access and “camps” on the local signal broadcast by the network. Subsequent access to place a call, send a text message, or access the internet is all initiated through communications over this channel. For unknown, contraband devices on the system, any subsequent action is met with denial. While the device still appears to be on the commercial network, access to the actual commercial network is denied. For authorized devices, the MAS system redirects them to the actual commercial network allowing these approved devices to continue to maintain access to their commercial service. Through this basic logic, MAS provides the appropriate balance between control of contraband while permitting approved users to continue to use their device in the same controlled space. The iNAC manages the current technologies deployed by the wireless industry. It is the only proven Managed Access Solution in the market that has evolved through 2G, 3G, 4G, and now WiFi and 5G. The software defined radio architecture and flexibility of the power amplification system has allowed continued support, while the surrounding commercial wireless technology evolves. Even as new networks and technologies lurk on the horizon, Tecore’s iNAC system is ready to support. The iNAC supports the current bands where wireless technologies are deployed. Maintaining support for the entire deployed spectrum is an ongoing challenge that requires system infrastructure that is prepared for the future. While the iNAC addresses the two listed items above, the baseline architecture is also flexible enough to anticipate the changes coming in the future that can impact the deployed infrastructure. With the reality of 5G and the Internet of Things (IoT), being able to adapt the solution to the changing landscape of wireless is key for continued success of a MAS deployment. The distribution of RF energy indoors for small to large coverage areas can be resolved by deploying a fiber based distributed antenna system (DAS). The signals are then distributed by multiple antennas throughout the coverage areas. Outdoor solutions are applicable for larger facilities or coverage areas. This type of deployment operates at a higher RF power and can utilize existing structures. The iNAC has been installed in urban, as well as rural facilities. While the core technology remains the same, the architecture of the infrastructure required to build the appropriate RF umbrella is significantly different. No two installations are identical which impacts the methods and equipment set required to create the proper RF footprint for the institution. Additionally, the surrounding area can also impact the required equipment set based on the required level of control of the MAS signals to obtain the proper balance with the commercial networks outside the wall. iNAC is the proven Managed Access solution when considering successful deployments in various, challenging operational environments. While the basic MAS technology concept provides a basic decision mechanism of approved or an unapproved device, there are unique cases where exceptions need to be made. For example, in many locations in the U.S. and around the world, the system must support an override capability for emergency calls (911 or 112). In this case regardless of the device’s status, the call is allowed to complete. This support provides compliance in areas where blocking of emergency calls is illegal or otherwise prohibited. Additionally, the iNAC supports the Communications Assistance for Law Enforcement Act (CALEA) for lawful intercept in accordance with court orders or applicable laws. The Tecore Networks iNAC Managed Access is based on a solid foundation of patented technology. As a wireless network infrastructure provider, Tecore created the MAS from a cellular based solution. Given almost 30 years of experience in deploying intricately designed networks, Tecore has been the leader in transiting knowledge of wireless networks to effectively prevent illegal communications before they occur. Tecore’s Intelligent Network Access Controller (iNACTM) Managed Access Solution (MAS) achieves the appropriate balance between communications control within the walls of an institution and a harmonized deployment with the surrounding commercial wireless networks. The solution leverages Multi-Technology wireless support, as well as the methods of access control outlined in the nine specific Managed Access related patents Tecore holds.